Morphology: Big ears on medium sized head, firm and muscular body, long legs and fine bones. Health problems: Pay special attention to the ears as they may be subject to hypertrophic cardiomyopathy and feline infectious peritonitis (1). Those specific characteristics are key to determine what is the best cat food for Sphynx. Our choice is based on those traits and on experts advice. For more information about the Sphynx breed, check out this pawesome video! Those eccentric traits hide a very unique elegance, a touching personality and and incredibly smooth and warm skin. Anybody would be lucky to have a Sphynx for friend ! To compensate the absence of hair, his metabolism works faster than other cats meaning he needs more energy to stay healthy. That’s why Sphynx’s eat much more than any other cat! You will need to provide him with a nutritious food that will fill all his needs. What is then the best cat food for your Spynx? What should you give to this unique cat for him to live a happy life? Check it out in this pawesome article. Taste of the Wild $$, 15-lb bag Grain-free recipe made with real roasted venison & smoked salmon. 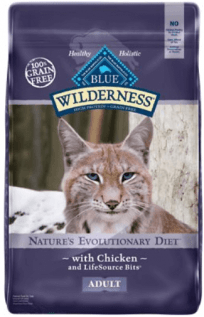 Blue Wilderness $$, 12-lb bag Real meat #1 ingredient in this antioxidant-rich grain free cat food. Purina Beyond Dry Cat Food $$, 13-lb bag Natural and nutritionally complete with real protein and simple ingredients. Best Cat Food for Sphynx | Why Our Selection? Whatever you decide to feed your Sphynx, know that his metabolism works much faster than other cats. Indeed if you have the chance to touch a Sphynx, you will notice how warm his soft skin is! This warmth is produced to compensate the lack of hair. As you can easily guess, hair on fluffy cats retain the heat better. Your Sphynx will eat more to produce this heat so you need to make sure he has enough food all day long. It is a good idea to allow your Sphynx to eat small portions at regular intervals. As with all different types of cats it is essential that your kitty receives a wide range of nutrients. A grain-free cat food is a must to start with but you must also find a food that satisfies the vitamins, minerals, antioxidants and amino acids your cat needs. The kibbles from Taste of the Wild are a must for a Sphynx cat. Many Sphynx owners and vets recommend this food as it contains everything your little friend needs to live a happy and healthy life. The good thing with this formula is that you do not need to transition from a kitten food to a mature cat food as your cat grows up. It’s the same formula that will provide the essential nutrients, vitamins, antioxidants, minerals and amino acids throughout every life stage. This grain-free recipe features sustainably-sourced protein to satiate your Sphynx’s carnivoric desires. Now let’s dig a bit deeper, why is Taste of the Wild so good for your Sphynx? Real meat: Real chicken, roasted venison and smoked salmon. Not only does it provide all the essential meat proteins that your Sphynx desperately needs, it also gives an amazing taste to those kibbles. Antioxidants: Contains vegetables and fruits that provide all the antioxidants your cat needs for a healthy immune system. Finally this food meets the nutritional levels established by the AAFCO cat food nutrient profiles (2). 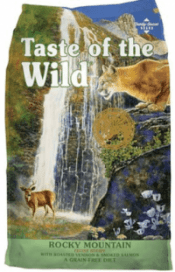 Let’s keep this short, Taste of the Wild is for us, simply the best cat food for Sphynx. It is the second best choice for Sphynx owners. The Blue Buffalo Wilderness will also provide a superior nutrition for your Sphynx. What makes Blue Buffalo so special is their unique blend of real protein and LifeSource Bits. There’s never any grain, filler, corn, wheat, or any nasty artificial business. Just pure goodness! It’s one of the best (affordable) cat food brands for Sphynx and many other cat breeds. From the source of the ingredients to your cat’s bowl, you can easily trace everything that entered in the composition of the food! We know cats are family and they should be treated as such. The Purina Beyond Simply is made of goodness! It is created by cat experts so you can be sure that your little Sphynx will have everything he needs! TIP: Vomiting and diarrhea are obvious signs that the Sphynx is unable to cope with a new type of food. Always make sure you follow the manufacturer’s guidelines to transition from one food to another. If despite your precautions you notice those obvious signs, you will need to find another food more suited for your Sphynx. The Sphynx! What a beautiful and mystical cat. 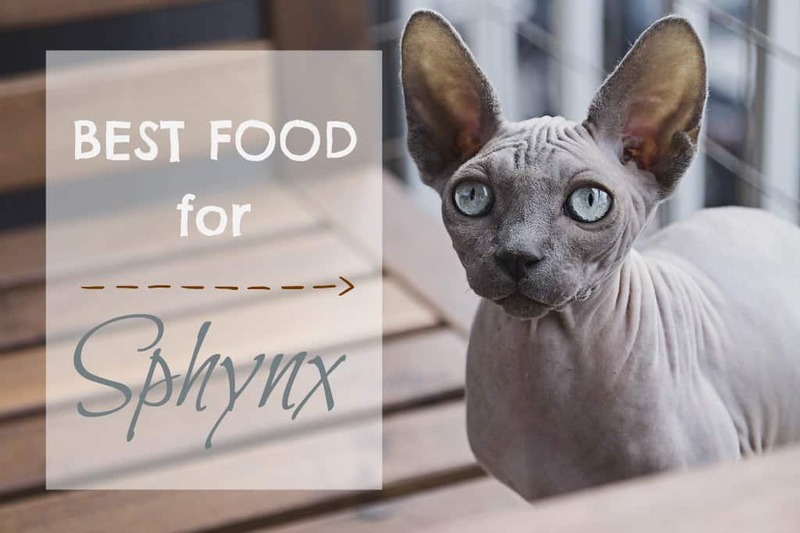 We hope you were able to find the perfect cat food for your Sphynx! Although hairless, the sphinx requires special care. If you now have the right food you also need to understand his other needs. First and foremost, the sebum is not absorbed by the hair and tend to lubricate the skin. This means baths are required on a regular basis. It’s also very important to monitor their exposure to the sun – it is possible to put some sunscreen to prevent any burns.